Mobile development team Blue Wind, bring us Zombie Shock; a blow em up, zombie survival game for the apple iTouch and iPhone. This simple yet addicting game is a wonderful app that can kill some serious time riding the bus or ignoring that crazy friend that just won’t leave you alone. 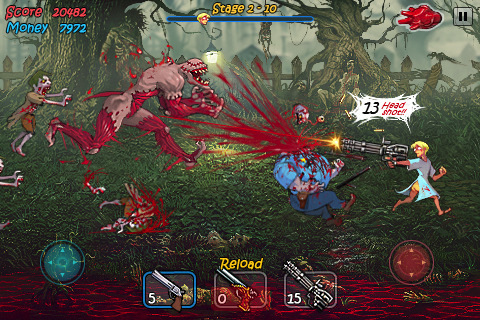 The main goal of the game is to survive hordes of zombies chasing after you. Your character runs throughout the whole game and you just blow up whatever zombie that approaches you. There are many weapons that you can buy and upgrade in the item shop at the end of each level. These weapons include pistols, shotguns, machine guns, crossbows etc. The controls are fairly simple and very smooth. On the bottom left you move up, down, left, and right. To the right side you press or hold to fire you weapon. If this is too easy for you, you can switch it to a more difficult control setting which requires aiming with the left controller. The game is told through a comic book type art style which is beautifully drawn. The in game enemies are also wonderfully animated too along with the many other enemies that are later introduced. The music on each level is easy to listen to and at no point did it become irritating. The game play is fun but after awhile it’s all just rinse and repeat. Fortunately enough the game isn’t short. With so many weapon upgrades along with stat boosts along with new zombies with special abilities and boss battles that are quit challenging. You are allowed to carry up to three weapons, and it’s always fun to find the best weapon combinations that may keep you alive the longest. Overall, I am quite satisfied with this game. With the price of only $1.99, Zombie Shock will supply you with enough game play and customization you paid for and then some. There is also a Zombie Shock lite version in the app store that is completely free. Go download that and give it a try if you are like me, and love blasting away at zombies. 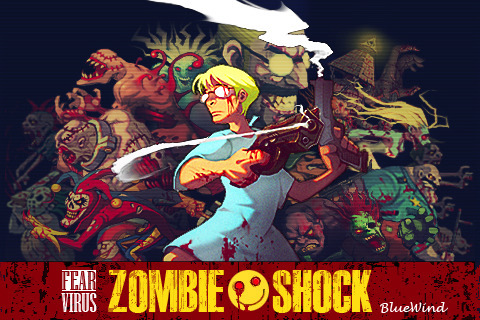 Sample the free version of Zombie Shock on your iPhone. AppSafari review of Zombie Shock was written by Vincent Tam on March 4th, 2011 and categorized under Action, App Store, Arcade, Games. Page viewed 4084 times, 1 so far today. Need help on using these apps? Please read the Help Page.